(CNN) -- Jack Quavis doesn't shy away from heated political discussions; in fact, he encourages them. Politics is an ever-present topic in his one-room barbershop in Buffalo, New York. 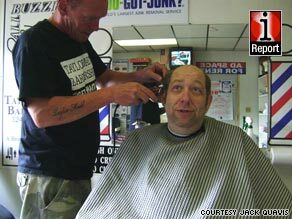 Jack Quavis gives a customer a haircut at his Buffalo, New York, barbershop. He's the owner of Taylor Mae'd Barber Shop, an old-fashioned place with one distinguishing feature -- customers can share their thoughts on camera about current events while Quavis trims their hair. "I'm tired of the average person not being heard," he said. "At the barber shop, guys will open up. Everybody's eager to talk about something." Politics, though often a taboo subject at social events and many workplaces, is the topic of choice in his shop, said Quavis. There's one barber chair used for haircuts. The others form a makeshift seating area. Photos and bumper stickers cover the walls, along with a handful of ponytails from past customers. "It's a small, cozy kind of place," said Quavis, one where visitors "can speak their mind and not be ridiculed for it." Men share opinions with Quavis that they wouldn't be comfortable discussing with their closest friends, said the longtime New York resident. "They trust me." "More or less, I'm not a threat to them. I'm not going to judge them for their opinions." Quavis, 46, founded Taylor Mae'd a decade ago and began recording videos of his conversations with customers in December 2008. In an introductory video on his Web site, Quavis explains his goal. "This is a chance to take a look and see what Americans are passionate about." He also offers a warning: "If strong opinions offend you, then maybe this isn't the Web site for you." Perhaps surprisingly, many customers allow their discussions to be filmed and shared online. Quavis posts his barbershop videos on CNN's iReport.com and his personal Web site, All Buzzed Up. Though the men speak with obvious fervor, they manage to stay calm and still as scissors fly through their hair. Quavis heard plenty of political chatter when he worked as a bartender, but says those conversations were never as civil as those in the barbershop. What if ... we all worked together? On October 10, join iReporters around the world who are volunteering or giving to charity. Show us how you made a difference. Send your video and snapshots. During a typical recorded conversation, Quavis will ask about a current legislative issue, then let the customer talk as he goes to work. Often, the energetic barber will jump in to share his observations. "I try to keep them guided by what's going on in the news today," he said. On Inauguration Day, Quavis recorded two interviews with customers. Both seemed excited to see Barack Obama as president and happy that George W. Bush was leaving office. "I'd give him a four out of 10," said one customer, referring to Bush's performance. "What'd he get a four for?" asked Quavis. One of Quavis' favorite topics these days is the ideological divide among politicians. Republicans and Democrats on Capitol Hill have battled over health care reform for months now, seemingly unable to reach an agreement. The barber talks quickly and passionately, letting a few choice words slip when he's on the subject. "Our government's a joke right now," he said. "If [politicians] stop being Democrats and Republicans and start being people, maybe these issues wouldn't be so tough. Don't vote along party lines, vote with what you think is true." Several customers have echoed Quavis' sentiments. "They've got to stop catering to big business and special interest groups -- got to listen to the people more," said Larry Switzer, a frequent Taylor Mae'd patron who shared his thoughts on camera. "You would think that we would be in their special interest," said Quavis, chuckling. As he trims Switzer's hair, the two chat like old buddies. His 400-square-foot shop, which specializes in men's haircuts, sits on a busy road a few miles south from the heart of Buffalo. The Bethlehem Steel plant, which closed in 2001, looms down the street. "A couple thousand acres, sitting there wasted," said Quavis. The economy has taken its toll on Taylor Mae'd as with many independent barbershops across the country, said Quavis. Customers go longer between haircuts and stories of being laid off from jobs seem more and more common. But, despite it all, Quavis remains optimistic. He's held a variety of jobs, but said he likes being a barber best. "It's the best job I've ever had," he said. "I love the guys who come here; I love their opinions; I love what it's all about." Tom Ammo visits the barbershop once a week. He drops by Taylor Mae'd every Thursday morning with donuts and coffee, and he and Quavis record a video talking about current events. Some days, the ironworker will spend a couple of hours at the shop. "There aren't many places you can do that," said Ammo. "Barbershops are a dying breed -- the kind of barbershop where you can go in and hang out with the guys." Ammo, 45, has known Quavis since high school. The men often talk about the government, but recently branched out to sports. Ammo now gives his predictions for upcoming Buffalo Bills NFL games during his weekly visit. "He's a people person," said Ammo, referring to Quavis. "Not too many people have the gift of gab and the ability to get people to talk." Ammo said he's never liked public speaking, but finds being on camera a different experience. "I was petrified to do a speech in high school or talk in front of crowds," Ammo said. "But when he puts the cam on, I'm at ease and everything flows." Quavis said his friends scoffed at the idea when he first decided to start recording videos, but he's starting to see a change in opinions. "Slowly but surely, more and more people are coming around," he said. The barber says he doesn't affiliate with any political party. "I'm a realist, neither Democrat nor Republican." His opinions are often influenced by his customers' various viewpoints. "Even if I disagree with something, if everyone else thinks it's the best for this country, I'll go ahead with it." Washington politicians could learn a thing or two from Taylor Mae'd and other small barbershops, said Quavis. Whether discussing the economy, health care, or another political topic, everyone seems to find a way to agree. "Somehow or another, when men come into a barbershop, we manage to find common ground."